Earlier today, BAFTA released their longlist of possible final nominees. They are the only awards that give people a heads up of what may be nominated a week later (Jan 17). But this additional offering is not fully embraced by everyone, as you can tell by the reactions earlier today. It's good to see Michael on the longlist of Best Actor possible nominees, and his name had an asterisk next to it, signaling that he along with four other actors received by far the most votes, pretty much indicating what the final five nominees list would look like. The downside of this longlist is that it makes public record the full list of actors they are thinking about, but in all seriousness, only those five or six with an asterisk are going to be given further consideration. I can do without viewing the longlist, but because BAFTA does this, it's akin to gawking at a car accident, you can't help but look at it, just to SEE. In the past nearly five years I have been watching Michael's career, I have been bummed out twice by BAFTA slighting him; first, they totally ignore him for Hunger, and second, they nominate him for their Orange Rising Star, only for him to lose out to a Dr. Who character actor. Sigh... oh the drama in supporting a brilliant young actor. Last night in Hollywood, Haywire had its premiere, but whathisface was missing, and Ewan looks very sad about that. By now everyone knows that Michael has a minor but highly impressive role in the film, and I'm very excited to see it. Meanwhile, here are a few more images from Haywire. In an interview with The Guardian, the female reporter is big time swooning over Michael, but it's really cute. She refers to him as a boy, and in all honesty, he does come across as very youthful, honest, open, and funny - like a boy. So it's more of a term of endearment instead of mocking him or disrespecting him. I've referred to him as a boy many times before and it's just something I think is part of his charm and charisma. Even when Gold Derby Editor, Tom O'Neal interviewed him a couple months ago, I asked him what he thought of Michael, and he said, "He's a charmer, that boy." So sweet! I will continue to refer to Michael as a boy every so often... as long as he keeps acting like one. This is Fassbender's moment. After years of playing relatively minor roles he has, in quick succession, starred in Jane Eyre, A Dangerous Method, X-Men, Haywire and Shame, and as most women who have seen these films know, he is, at 34, in his leading-man prime: blue-grey eyes, long black lashes, a habit of ducking his chin in a way that acknowledges both how pretty he is and how vaguely embarrassing he finds it, plus there's the Irish accent and then the hair, which comes up off his forehead in waves of auburn. Poor woman... I wonder if she wrote this down in her journal as she was speaking to him, to keep alive that moment of being in his breathing space. In fact, I wonder if the woman was an undercover Fassinator. Hmmmm. Here's a video interview of him playing with a nerf gun with an interviewer. More proof that he is a boy! I can always tell when a woman write the article. they always gush about him. makes me laugh every time. It looks like BAFTA may finally make it into your good books this year. I'm disappointed for Steve, but then other great directors didn't make the list either - that's just how it goes. Also, regarding Noel Clarke winning the Orange Rising Star award a few years back...I think you'll find this was actually very much deserved. He's a very accomplished writer and director, as well as an actor. Please check out his wiki or IMDB pages for more info. (He also starred in Centurion with Fass)! @Lisa, it has been a bummer than Steve hasn't been acknowledged much in the precursors, with the exception of a few. And yes, I am aware of Noel Clarke, but being a Fassinator, I just felt that Michael was the more outstanding rising star that year. And that award was voted by fans, and Michael had Hunger under his belt already along with notable BBC TV work that I still haven't seen yet (Murphy's Law). 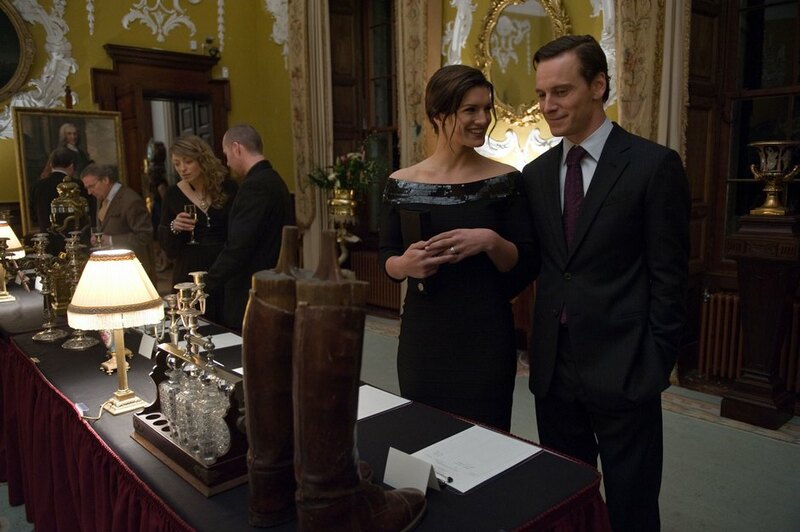 Lord have mercy he looks suave and delicious in Haywire. 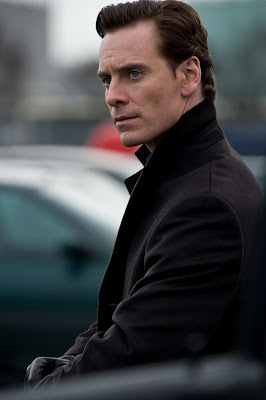 Between Shame getting wider release, Haywire gearing up to be released...and Dangerous Method coming out on DVD probably by summer our Fassy Cup runneth over. Until now I did not know that Michael was not recognized by BAFTA for Hunger or Steve I gather. That is truly disappointing, I was mad the Oscars did not recognize this performance but I assumed he had not been passed up in the U.K. Goes to show this kind of thing happens everywhere.